Classic BRIT Awards 2012: behind the scenes! The glitz, the glamour, and all the classical artists under one roof at the Royal Albert Hall for the biggest award ceremony of the year - Classic FM sat in on the rehearsals and captured the atmosphere as it happened. The London Chamber Orchestra and Crouch End Festival Chorus rehearsing 'Amazing Grace' in preparation for tonight's performance with Andrea Bocelli. The Royal Albert Hall is overrun with a whole host of classical musicians. The ceremony might not be starting for a few hours yet, but the atmosphere is electric. Possibly the most glamorous place to eat one's lunch in London? The tables are laid in the middle of the Royal Albert Hall. John Suchet is broadcasting live from the basement of the Royal Albert Hall. Jamie Crick will be here this afternoon. 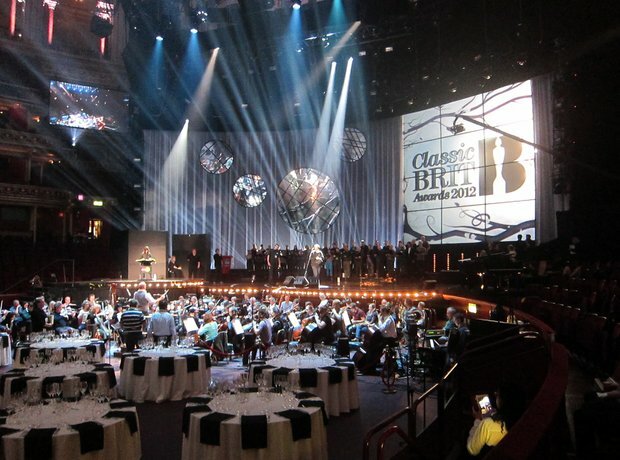 We can tell it's going to be a fantastic evening as the decorations and Classic BRITs logos adorn the Royal Albert Hall. John Suchet broadcasts to the nation from various locations in the Royal Albert Hall. Who knows where he'll end up! A deputy Andrea Bocelli stands in during rehearsals so the tenor can save his voice in preparation for tonight's performance. Dazzling lights and beautiful music - we're gearing up for an amazing evening of awards tonight. The performers are rehearsing on stage throughout the day. A bird's eye view of the tables at the Royal Albert Hall - later this evening, the hall will be filled with classical music's greatest performers, and a host of celebs to boot. Nicola Benedetti, André Rieu, Andrea Bocelli, Gareth Malone, the Military Wives, Lord Lloyd Webber - so many big names, all on this very stage. It's not just about the celebrities this evening - tonight is a celebration of classical music, from the smallest piccolo to the largest double bass. Gareth Malone's arrived! Hiding among a group of singers for now, he'll be in the limelight later, conducting the Military Wives in their performance of 'Sing'. Instrumentalists and singers line the corridors of the iconic concert hall, waiting to rehearse for this evening's fantastic concert. On stage at the Royal Albert Hall, the Military Wives Choir are rehearsing 'Sing', the song they performed at the Jubilee concert. We can confirm it's sounding amazing. The London Chamber Orchestra accompany the fantastic Military Wives Choir, who are amplified all around the hall. The orchestra, the choir, Gareth Malone - it's all happening on stage at the Royal Albert Hall. Doesn't it look fantastic? Sounding amazing, the Military Wives Choir are being beamed out on big screens across the auditorium of the Royal Albert Hall. Gareth Malone will be performing on stage tonight with the Military Wives Choir, Lord Lloyd Webber, and Gary Barlow. A fantastic line-up! Jamie Crick has arrived, broadcasting Classic FM Requests from around the building. We're here all day, broadcasting live from the Royal Albert Hall until 5pm. Jamie practises his carpet-laying skills, on the very carpet where we can expect to see classical music's biggest celebrities later tonight. Should you be on air, Jamie? A full run through rehearsal is happening right now, with interludes for all the awards to be presented, and all the presenters' speeches being read out in full by stand-in members of the team. A perfect backdrop for 'Amazing Grace', complete with bright lights and a beautiful sunrise. Capturing the full glamour of this evening's award ceremony - and it hasn't even started yet! Myleene Klass rehearses her speeches on stage in the hall. Look closely and you can see the chandeliers used on stage in the Phantom of the Opera performance! Dry ice, shining lights, and amazing singing from the cast of Phantom of the Opera. Look who we've found - it's Benjamin Grosvenor! Well, he'll be sitting here later tonight. He's nominated for the Critics' Award and MasterCard's Breakthrough Artist of the Year Award. The beautiful Nicola Benedetti stuns the room into silence with her rendition of the theme from Schindler's List, and it's only the rehearsal. She's on stage now, performing in front a backdrop of a ballet dancer. Shining like a true star in rehearsal, we know Nicola will bring a touch of glamour to the red carpet. We'll be interviewing all the stars later this evening. An explosion of colour, on stage at the Royal Albert Hall, playing some brilliant Viennese music. A few guests are even waltzing at the front! Playing Strauss as we speak, André Rieu and his orchestra of beautifully attired musicians, adding a touch of fairytale magic to the afternoon's rehearsal. In an attempt to get as many celebrities on stage at once as possible, the stars of 'Sing' rehearse on stage. In fine voice, the Military Wives are sure to wow the audience at tonight's performance. Accompanied by Gary Barlow on the piano, and expertly conducted by Gareth Malone. Combining the best of pop, musical theatre, and classical music, Gary Barlow and Lord Lloyd Webber perform a celebrity duet. We don't want to give too much away, but it's sounding amazing. Gary Barlow dashed away at the end of the evening, but he had time for a quick photo call with his choral chum, Gareth Malone, which he posted on Twitter. Hayley chats to Classic FM about her nominated album, 'Paradiso', under the Classic BRITs umbrella. Gareth Malone and the Military Wives chat to Lucy Coward before their bumper evening of performances. They also made an appearance at the launch party, so we caught up with them once more! Lights, camera, action - and Jamie Crick is on standby, ready to interview all the stars of the Classic BRITs. The trumpeter presented the Composer award this evening at the Classic BRITs. Chorister-turned-chatshow host, Aled Jones, stayed up past his bedtime to share a few words with our very own Jamie Crick. In her Dolce and Gabanna dress, Nicola looked and sounded amazing - she talked passionately about arts funding in her acceptance speech. After their spell-binding performance on stage, Jamie caught the West End stars backstage in the media room, before they got changed out of their costumes.